Roof Repairs Performed 24 Hours a Day, Seven Days a Week in & around Washington, D.C. If you need roof repairs right away, it’s nice to know Shiner Roofing, Siding and Windows is available 24 hours a day, seven days a week. Since 1981, Shiner has been the leading residential and commercial roofing and home improvement contractor in Northern Virginia, Maryland, and Washington, D.C., with more than 16,000 home improvement projects completed. We bring the same courteous, prompt, and expert service to a repair job, big or small. 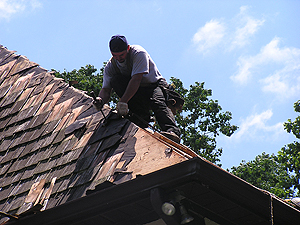 And unlike some roofing contractors, we back up much of our repair work with a one-year workmanship warranty. Every building needs roof repairs every now and then, especially after years of exposure to the snow, rain, heat, and humidity Washington, D.C. homes and commercial structures are exposed to. Tile roofs can crack or slip. Asphalt shingle roofs can curl. Every roof needs a bit of sprucing up now and then. Shiner is licensed, bonded, and insured in the states of Maryland and Virginia and in the District of Columbia. We only use premium materials on all of our roof repairs. All of our employees are trained in the latest roof repair techniques and bring years of experience to every job. No matter what material your roof is composed of – clay tile, asphalt, steel, copper, rubber or any other – we’ll complete the job quickly and affordably, wherever you are in the region. Contact Shiner 24/7 for emergency roof repairs, siding repairs, and gutter repairs. We are proud to provide unparalleled service, workmanship, and value in McLean, VA, Great Falls, VA, Vienna, Arlington, Fairfax, Oakton, Georgetown, Alexandria, Falls Church, Potomac, MD, Leesburg, Bethesda, and communities throughout Northern Virginia, Maryland, and Washington, D.C.